Saab Grintek Defence has been awarded a contract for deployable cold chain equipment for the South African National Defence Force (SANDF) as part of Project Teamster. The company said that the deployable cold chain entity comprises several main components. One of these is a ruggedized military specification Refrigerated Container Unit, which is especially designed for the handling of organic goods in ambient temperatures found throughout the world. This 20 foot long modular unit offers multi-temperature refrigeration with separate fridge and freezer sections. A generator powers the refrigeration unit during transit or food distribution/storage in the field. 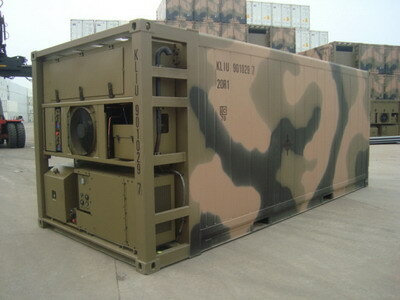 In terms of transportability the container is ISO lockdown enabled and can be transported by truck, sea, rail and air. Another component of the cold chain being supplied by Saab Grintek Defence’s Product Area Lead System Integrators division is a smaller box type container, which is air tight with two forklift pockets. This insulated bulk bin is a low cost, returnable packaging solution for fresh products and meat where insulated transport and storage are essential to maintain product quality. Saab said its double walled poleythene construction and lightweight polyurethane insulation allow for excellent temperature retention during transportation and storage, reducing the need for refrigerated transportation, saving both cost and energy. “These products will form part of the acquisition of a complete new field base capability for the SANDF, not only satisfying specified client requirements, but hugely contributing to the operating performance of deployed forces (being mobile or static), introducing new levels of materiel readiness and affordability,” Saab Grintek Defence said. The contract was awarded to Saab in March 2016 for delivery around June 2017. It covers 12 refrigeration units and 65 insulated containers. Project Teamster is to replace the mobile field kitchen capability of the SANDF, with field kitchens to enter service by 2017/18. Gas-fired stoves are being replaced by diesel fired units. OTT Solutions and Desert Wolf were awarded the first phase of Teamster, for 15 person field cooking units, in early 2016. The companies will supply 158 of these units over the next year. Further contracts are expected, for mass field feeding systems for 50 and 200 people and a mess facility for serving 200 people. Project Teamster is believed to be part of Project Swatch for the development and acquisition of mobile camping systems. This includes the acquisition of new water purification systems (under Project Blesbok) amongst others.